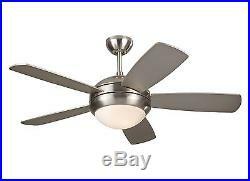 Brushed Steel Discus II 5-Blade 44 Ceiling Fan with Matching Blades & Light Kit. We also offer additional accessories for this item, including longer downrods & wall/remote controls. The Discus II ceiling fan is a 44" version of the popular original Discus 52" ceiling fan. With a minimalist, contemporary design and several color options, the Discus II fan can complement a wide variety of room styles. With an integrated halogen downlight, the Discus II fan has an optional remote control. Airflow is 4,262 CFM (cubic feet of air per minute). The fan's blade sweep is 44. Discus II fan comes with a three-speed pull chain. Brushed Steel housing finish with matching blades. Includes: Blades and light kit. Includes: (1) 75w Halogen Mini Candelabra (E11) base bulb. Includes: Extra long 6.5 foot wire for high ceiling installation with longer downrods. CK250 wall / hand-held remote. Want to Flush Mount This Fan? This fan can be mounted flush to the ceiling with the addition of Monte Carlo's Low Ceiling Adaptor MC90. Without the flushmount adaptor, the fan can be mounted with the included mounting assembly and downrods. 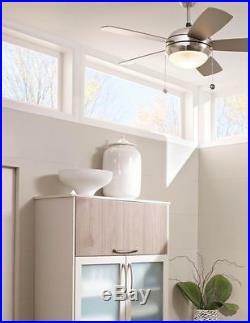 This fan comes standard with Monte Carlo's universal hanging system. This basic system allows for mounting on ceilings that have up to a 14 degree slope. For sloped ceilings between 15 and 46 degrees you'll need the Monte Carlo MC95 Sloped Ceiling Adapter. 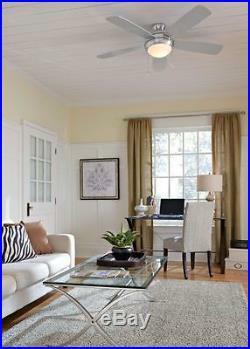 Many Monte Carlo Ceiling Fans work with 8 or 9 foot ceilings. If your ceiling is higher, you'll need a downrod. The rule of thumb is that fans should have a minimum of 7 feet and a maximum of 9 feet of clearance between the bottom of the fan blades and the floor in order to circulate the air efficiently. 9 Foot Ceiling - 12 Inch Downrod. 10 Foot Ceiling - 18 Inch Downrod. 11 Foot Ceiling - 24 Inch Downrod. 12 Foot Ceiling - 36 Inch Downrod. 13 Foot Ceiling - 48 Inch Downrod. 14 Foot Ceiling - 60 Inch Downrod. 15 Foot Ceiling - 72 Inch Downrod. 1 T4 Mini Candelabra 75 watt light bulb. Factory Depot is a worldwide distributor of bulk / overstock goods. Our large warehouse is located in St. Charles, MO, just outside of St. Our goal is to have every customer get what they ordered as described in the listing the first time, every time. This includes alterations or damages incurred attempting installation, noticeable markings from being mounted/installed, etc. We may request pictures of any damaged, defective, or incorrect merchandise before we will authorize a return. It is important you make sure the item is fully inspected for damage/defects prior to installation. Please report any damage or defects to us as soon as possible, as we are unable to cover any installation or associated costs. Any items deemed defective, damaged, or incorrect (by fault of Factory Depot) will be exchanged depending upon availability. The item "Brushed Steel Discus II 5-Blade 44 Ceiling Fan with Matching Blades & Light Kit" is in sale since Wednesday, March 8, 2017. This item is in the category "Home & Garden\Lamps, Lighting & Ceiling Fans\Ceiling Fans".